AMD has issued a driver update that will allow ultrathin notebooks or 2-in-1 laptops to connect via Thunderbolt 3 to external GPU enclosures using its Radeon graphics cards. AMD said it is the first time Thunderbolt 3 has been enabled to connect to an external GPU enclosure. Framerates per second using various GPUs and AMD's XConnect technology. Mobile PC gamers have always faced a tough choice when buying a notebook -- do they buy a heavy, thick gaming computer or an ultrathin that's easy to carry, but not really the best device for gaming? The driver update is for AMD's new XConnect technology that enables computers to run external video cards via Thunderbolt 3. 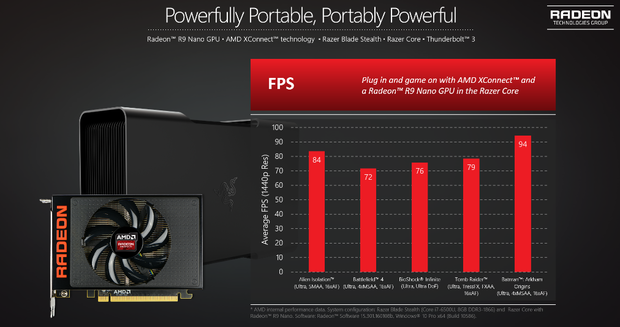 Gamers have "dreamed of buying the best of both worlds" with a lightweight laptop that also supports a powerful external graphics card, Robert Hallock, AMD's head of global technical marketing, wrote in a blog post. "When needed, the PC could also tap into serious framerates and image quality with a powerful external GPU that's not far from carrying an average gaming notebook. The point is: you choose," Hallock said. Introduced last year, Thunderbolt 3 offers data transfer rates over USB-C type connectors of up to 40Gbps for external peripheral devices; it's twice as fast as Thunderbolt 2 and four times faster than USB 3.1 (Generation 2). AMD's XConnect technology is a new feature that debuted today in Radeon Software 16.2.2 (or later) graphics driver that allows users to connect and use an external graphics card in Windows 10 over Thunderbolt 3. Thunderbolt 3 is seeing increased adoption among computer equipment makers. It is already compatible with Windows PCs and Macs, and it will soon work with Linux PCs as well. AMD plans to expand the list of Radeon GPUs that can support AMD XConnect technology, which will enable gamers to upgrade their enclosures beyond the Radeon R9 300 Series. AMD has a list of compatible systems, GPUs and enclosures for AMD XConnect technology on its website.